A more shipshape design, an integrated strap and heightened transparency bring a refreshing and wearable appeal to HYT’s fluid indication of time. 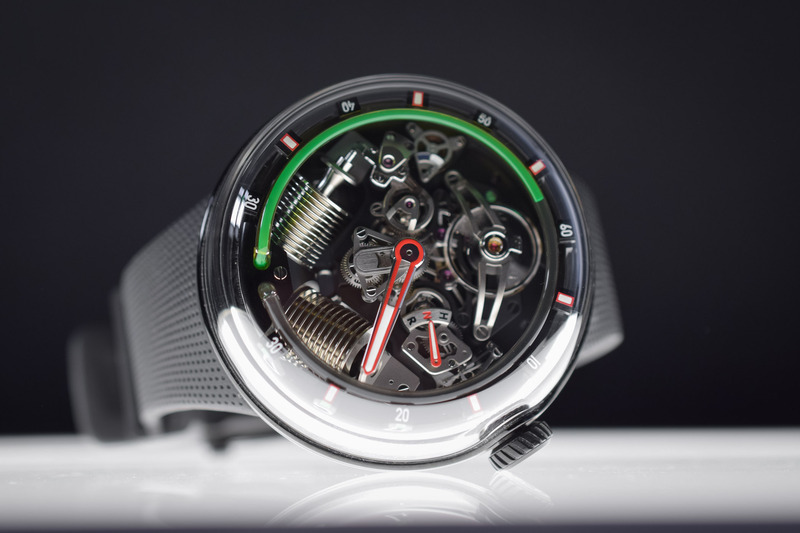 Two limited editions of the HYT H2O – one in a black DLC-coated case with bright green fluid, the other in a silver case with blue fluid – were unveiled during the 2018 SIHH watch salon. 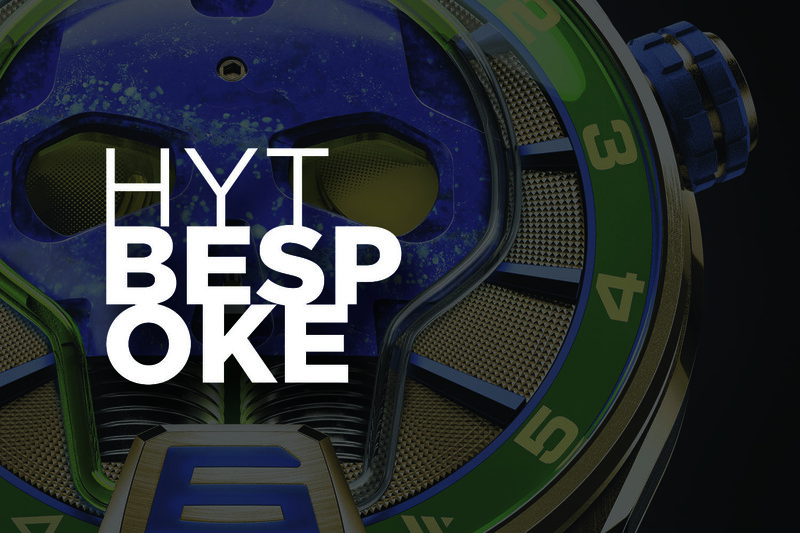 Exposed under a large sapphire crystal dome, the H2O models – an evolution of the HYT H2 – reveal the flow of time from every possible angle. With its original fluidic indication for the hours – which undergoes a fascinating retrograde phase – and a jumping minute hand, the novelty here is the refreshing design of the H2O. The dial, which has undergone a significant decluttering session, and the integrated strap conspire to make the watch more attractive, more streamlined and eminently wearable. 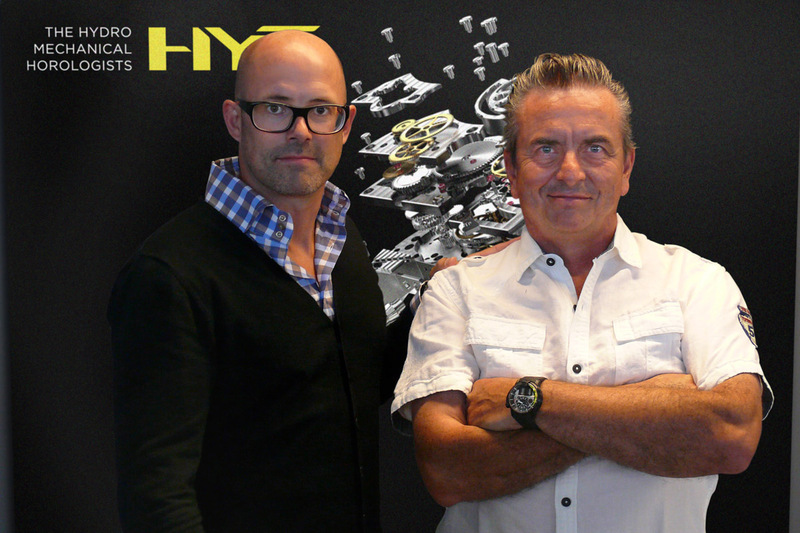 In just eight years, HYT has come a long way with its unconventional concept of fusing hydromechanics with horology. Firstly, for having won over sceptics that liquid could be introduced inside a mechanical watch without damaging the movement (usually a mechanical movement’s worst enemy), and secondly, for having moved beyond the concept-novelty stage and developed into a fully-fledged brand. I remember seeing the brand at the Palace (the tent rigged-up for indie brands at Baselworld) showing incredulous journalists the principles of fluid mechanics with a large contraption moving yellow liquid around a tube with the aid of bellows. 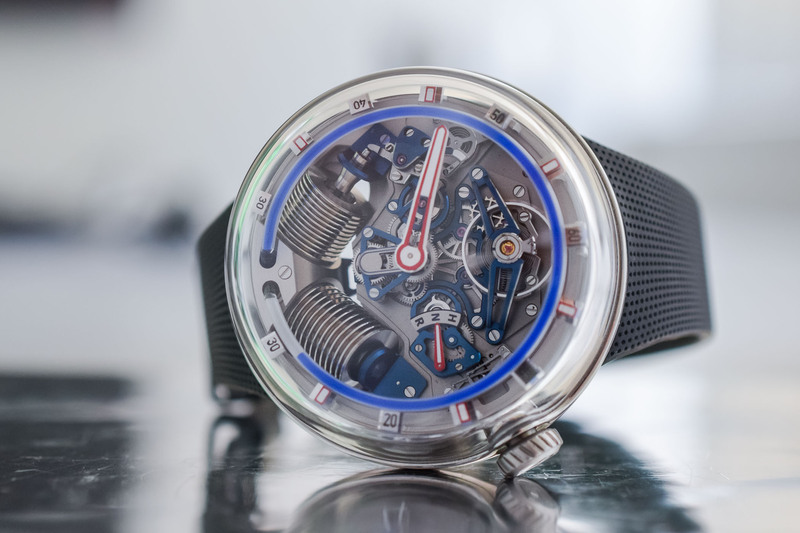 In comparison to the original HYT H1 and successive models like the HYT H2 and H2 Titanium Black DLC, the H2O is a study in transparency and light. 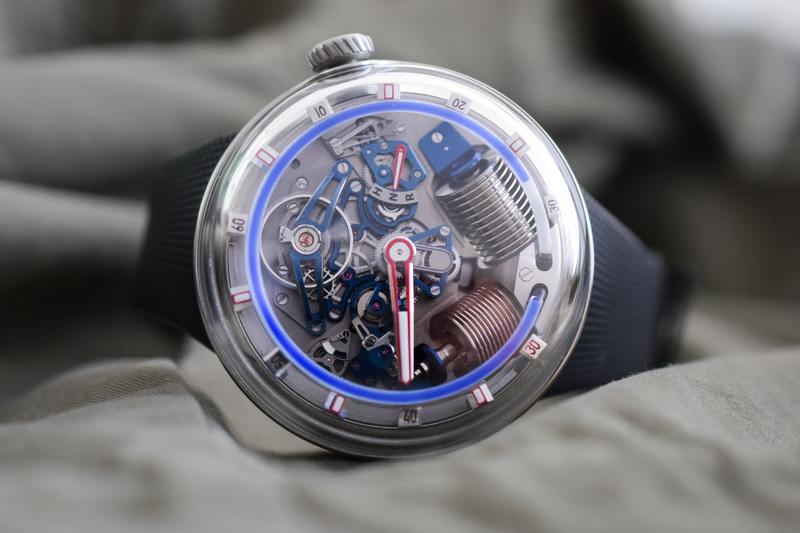 The sapphire crystal of the H2O is an invitation to engage in some serious micromechanical watch voyeurism offering frontal and lateral views of the movement. 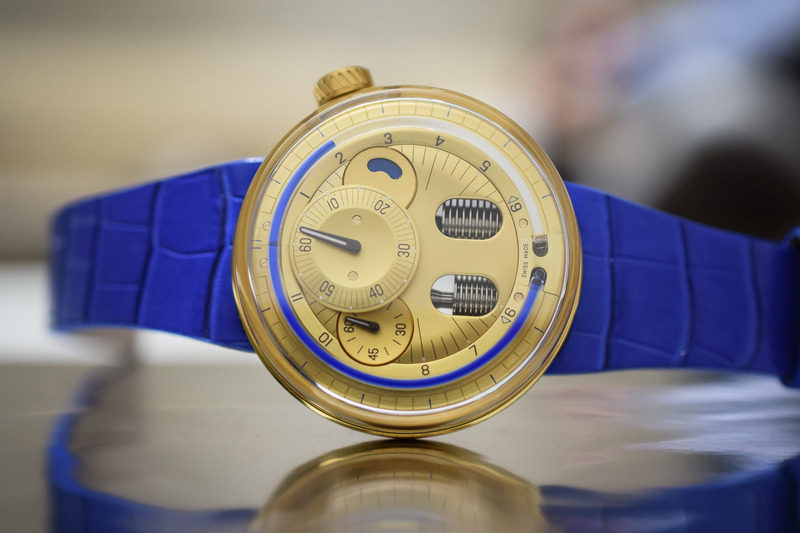 The rounded contours of the case – interrupted only by the screw-down crown at 3 o’clock – transmit an organic appeal. The idea of removing the hour numerals from their original frontal position on the dial and moving them down to sit close to the curvature of the sapphire crystal glass is an ingenious solution and frees up the dial, making it less cluttered and even easier to read than previous models. Peering in through the side, the large hour numerals, minute markers and hands seem to float. Coupled with the less cumbersome logo that was featured on the H2 model, the overall effect is one of more space and a better-ventilated dial. In pride of place is the cylindrical tube (or capillary) that transports the blue or green fluid used to indicate the hours. 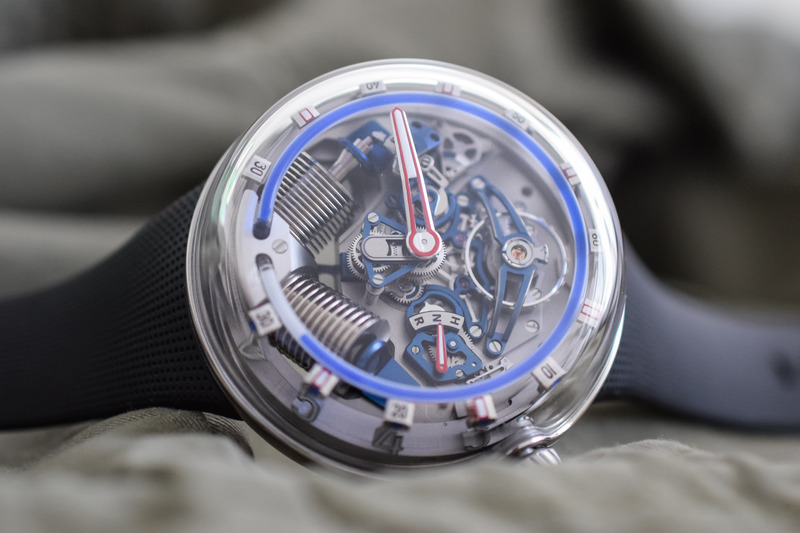 To get the juices flowing, HYT has developed a system composed of two reservoirs (or bellows) – one with transparent liquid, the other with coloured liquid – with a capillary attached at each end. The repulsion force of the molecular structure of the fluids creates an invisible barrier so they don’t seep into one another (just like oil and water). To propel the fluid, two bellows at 6 o’clock are activated by the mechanics of the watch via a piston that drives the bellow on the left. When the first bellow is expanding, the second compresses, and vice-versa, creating movement in the liquids. As the hours go by, the coloured liquid advances to indicate the time – this coloured liquid is, in fact, an indication of the time that has passed and the actual time is represented by the intersection of the two liquids. When the coloured liquid reaches 6 o’clock, the fluid indicating the hours switches to retrograde motion and flows counterclockwise back to the original position. In the centre of the watch, a large red hand filled with white Super-LumiNova® is used to indicate the minutes. Unlike traditional minute hands, this one performs a small jump over the gap between 5:30 and 6:30 o’clock. In a similar choice to the repositioning of the hour numerals, the minute track has been replaced by small, ten-minute interval blocks suspended on the edge of the capillary. But the fun doesn’t stop here and there are two additional complications on the dial. The first is a crown position indicator with N for neutral, H for setting the time and R for winding – a signature complication of APRP (the movement designer) – and the second is a thermal indicator to show when the watch is at the best temperature to be manipulated. 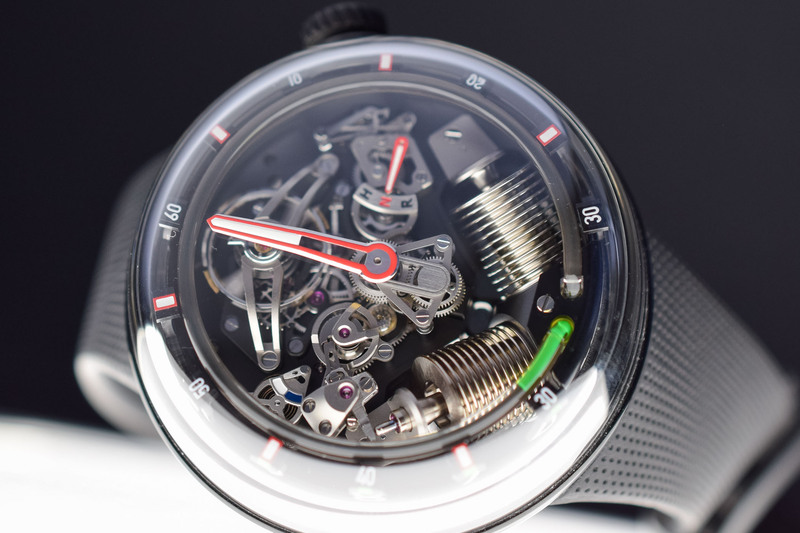 If the temperature of the watch is less than 15°C, HYT recommends you avoid handling the watch given the effect temperature can have on the viscosity of the fluids. Visible from the dial and sides, the manual-winding mechanical movement powering the HYT H2O is as much a spectacle as the fluidic hours. Offering exceptional depth, the openworked movement exposes all the technical elements – gear train, escapement module and bellows – generously. 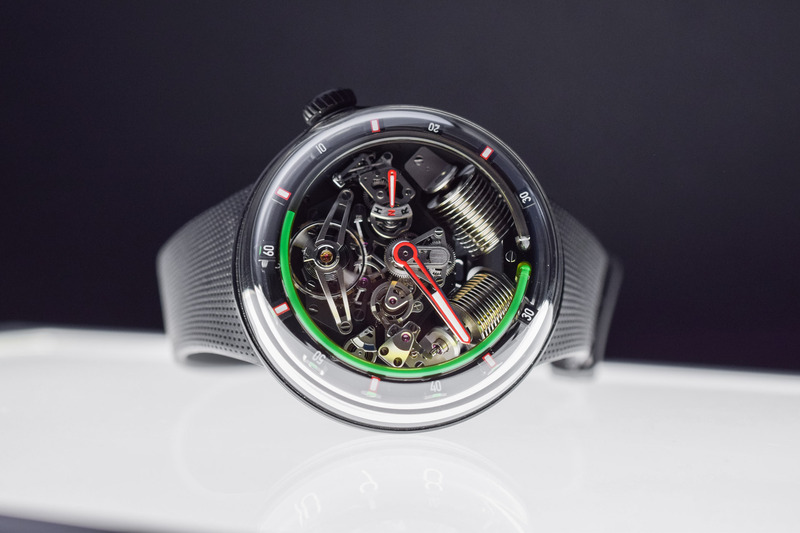 With its futuristic, somewhat industrial appeal, the H2O pursues its other vocation as an Haute Horlogerie watch and features exceptional finishes on the movement. 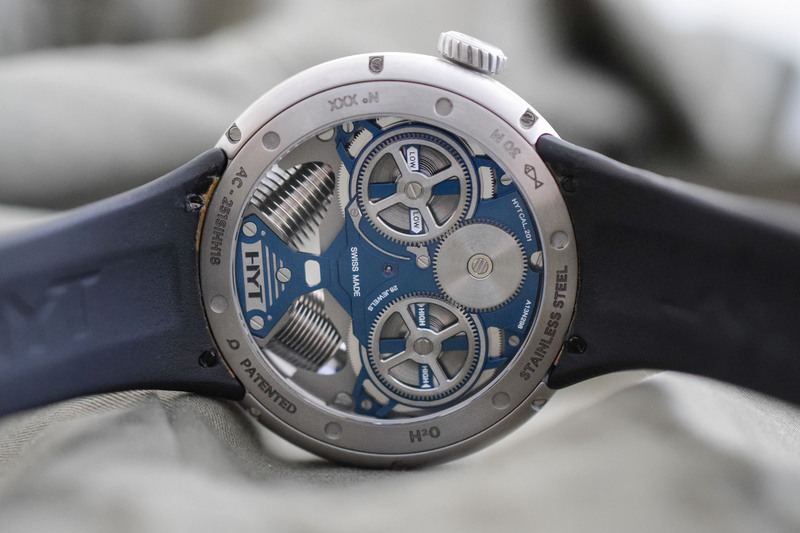 In the case of the blue model, the micro-blasted titanium bridges feature a matching blue PVD coating with satin finishes to create a harmonious ensemble. 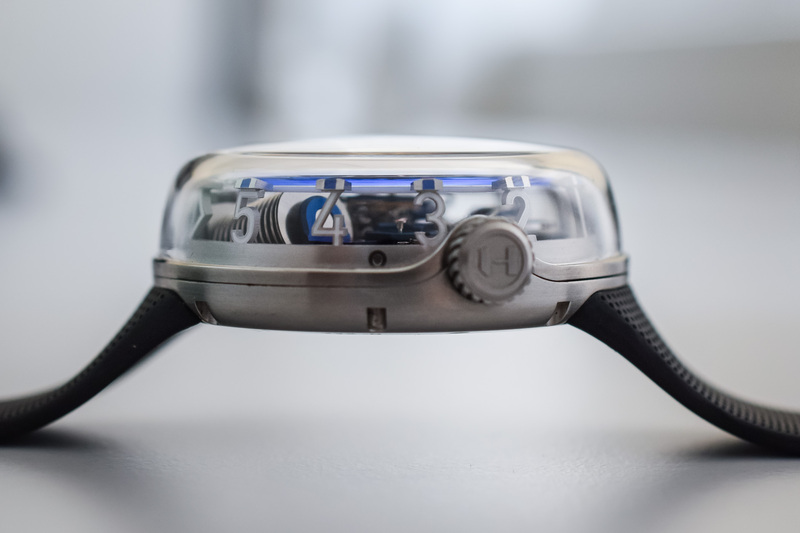 Unlike the H2 model, with its prominent lugs and lever on the crown, the sapphire and steel case of the H2O is as smooth as a pebble and inviting to the touch. Crafted in stainless steel with sleek polished and satin finishes, the vital statistics of this watch – 51mm in diameter and 19.95mm in height – sound daunting on paper. 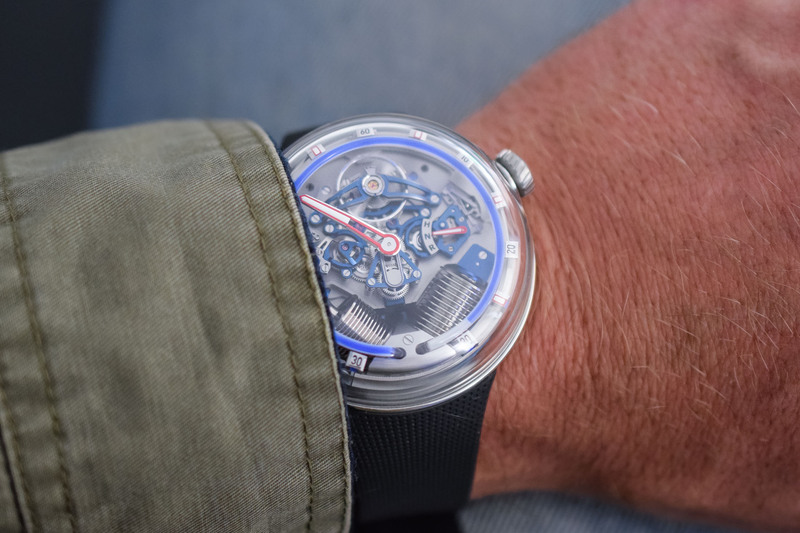 What is surprising is that even though the dimensions of this watch are bigger than the H2, the designers at HYT have produced a much more compact and wearable watch, which is far smaller on the wrist that the numbers would indicate. 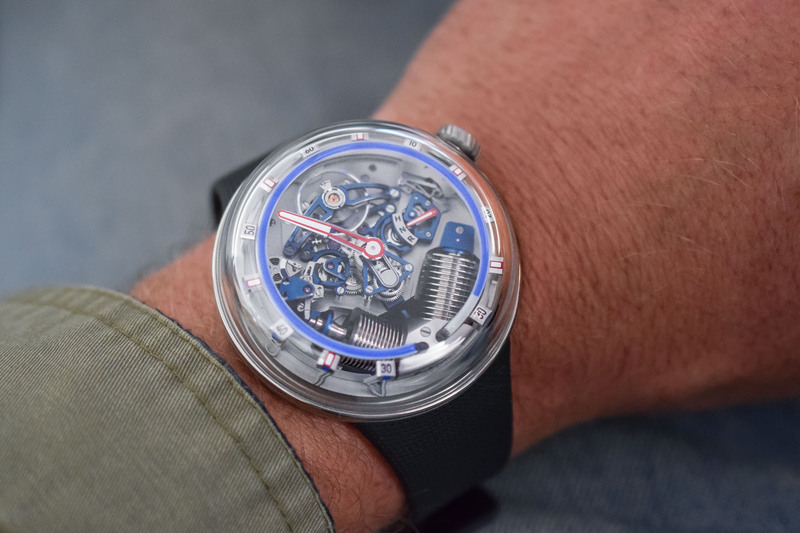 The fact that the box-domed sapphire crystal occupies most of the case and the lack of protruding elements certainly help. But the winning decision was to eliminate the need for lugs with the incorporation of an integrated strap. Seamlessly integrated into the case, the rubber strap becomes a part of the whole composition and is fundamental in creating a less voluminous timepiece on the wrist. In fact, with its lug to lug width of 48mm, the H2O could be equated in size to a standard IWC pilot chronograph. The reverse side of the watch displays the bellows and two massive barrels storing the mighty 192-hour (8-day) power reserve. To gauge how much fuel is left in the tank, there is a power reserve function with LOW on the left barrel and HIGH on the right barrel. Presented on a black rubber strap with a titanium folding buckle, the H2O comes in a limited edition of 25 pieces per colour. 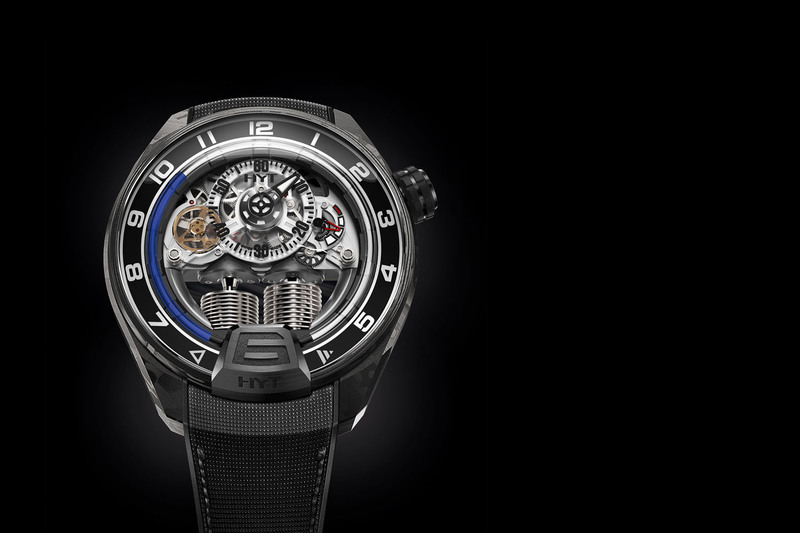 The retail price of the HYT H2O is CHF 95,000. 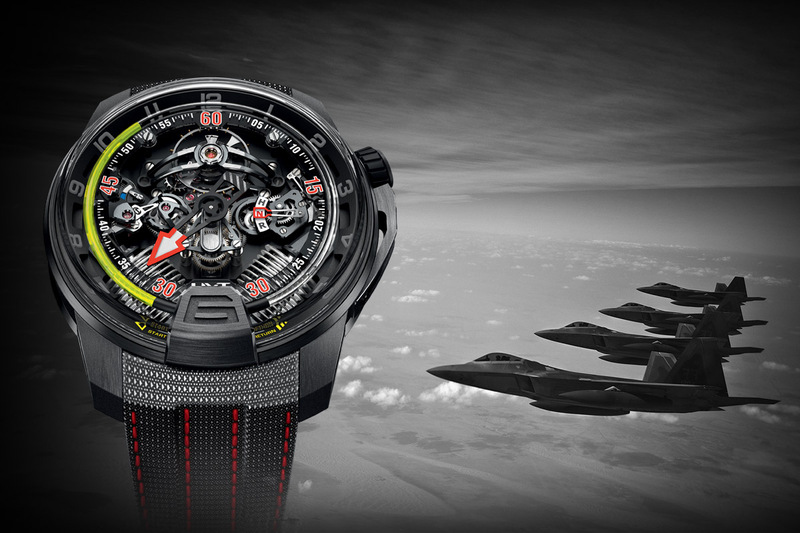 For further details, please consult www.hytwatches.com. An intriguing concept, it will take a while before telling the time with it can be done at a glance.